The career path we choose makes a difference in our lives. Gone are the days where traditional courses like engineering, medical, law, teaching, and management were considered to offer a growing career opportunity. The modern world has opened up a plethora of opportunities especially in the world of fashion where makeup and hair style is dominating the arena. Beauty professionals are in the quest for innovative techniques to satisfy the beauty needs of the clients. This has made makeup profession highly challenging. Unveil the artist in you by gaining good command over the profession with the help of an organised curriculum and real time exposure. If you are here to do justice to your artistic skills, then you are sure to turn a celebrity makeup artist very soon. 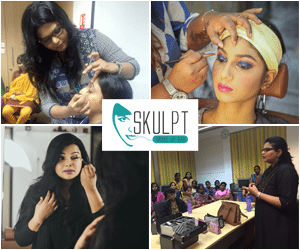 In this quest, our makeup artist programmes can come handy in catapulting your career.